This evening we enjoy the sumptuous Captain’s Dinner, with the chef serving specialities of the regions you’re visiting during your voyage of discovery. You awake under the azure skies of amazing Pont du Gard Roman aqueduct, one of the wonders of the ancient world. No amount of fame can diminish the first sight of this 2,000-year-old structure, which was the highest bridge built in the Empire –the Romans themselves considered it the most important testimony to their greatness. Its statistics are staggering: over 900 feet long and almost 160 feet high, with its stones each weighing up to six tons. To put this in perspective, the span of the Pont du Gard is greater than the width of the River Thames at London Bridge – and no mortar was used in its construction! The situation is lovely too, with pine- and cypress-covered hills adding to the harmonious setting. After lunch we visit the deepest Provence and amid the warm stone colours of Arles, many of whose historic monuments are UNESCO World Heritage Sites. Although small in size, it was the key stronghold on the Roman road to Spain, one of the empire’s richest possessions. Seagoing ships could reach here and the city became a regional capital, briefly ruling over Gaul, Spain and Britain. Our guided tour will help you appreciate the finer points of Arles’s magnificent Roman remains, including the splendid amphitheatre, one of the best preserved in the world, the earlier theatre built during the reign of Augustus and the Alyscamps, the ancient necropolis with its extraordinary atmosphere. The disturbed but great genius of an artist Van Gogh lived in Arles for just over a year, from February 1888. It was his most prolific period and, inspired by Arles and the light and beauty of the Provençal countryside, he produced around 300 works, including The Night Café, The Sower and, of course, Sunflowers. Rejoining the ship, we cruise along the Rhône. One of river cruising’s great pleasures is waking in a different place to the one you fell asleep in. 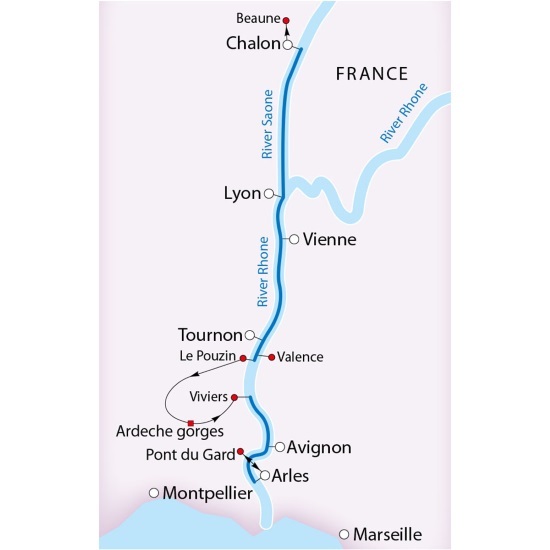 Overnight we enter perhaps the most picturesque section of the Rhône as the river squeezes and twists past Condrieu, Saint-Rambert-d’Albon and Saint-Vallier, with wooded cliffs rising high on both sides. Traditionally these stretches were the most dangerous due to fierce currents and varying water levels but, with the waters now tamed by a series of locks whose complex mechanisms never cease to fascinate, this afternoon can be spent relaxing on the Sun Deck taking in the exceptional views. Later we moor in the pretty provincial town of Tournon, with its imposing castle and tree-lined avenues on one side of the river, while on the other are the steep vine-covered hillsides of Hermitage, where another of the world’s most revered wines is produced – a fitting view as we enjoy another exquisite dinner. During another superb lunch the ship has cruised almost imperceptibly downstream and we enjoy Vienne, first a Celtic settlement, then a Roman stronghold under Julius Caesar. Strikingly located in a narrow section of the Rhône where the river meanders dramatically around a steep bluff, Vienne is a treasure trove of historic remains, including the stunning Roman Temple of Augustus and Livia, and a walk around its streets really brings its heritage to life. Rising this morning we’re berthed in Beaune, Burgundy’s wine capital, which is wonderful to wander around. At its centre is the Hospices de Beaune, also known as the Hôtel-Dieu. Originally built in the 15th century as a hospital for the disadvantaged, it’s a jewel of High Gothic architecture, instantly recognisable for its colourful glazed roof tiles arranged in dazzling geometric patterns. A prestigious annual wine auction takes place here each November, with proceeds going to benefit the Hospices and its charity work. Of course you can’t visit Burgundy without sampling its amazing wines, so we visit the cellars of a leading traditional winemaker for a tour and tasting. Nearby is Chalon, gateway to Burgundy and home of Nicéphore Niépce, the inventor of photography. On this tour we see some of the pretty yet surprisingly small villages that produce some of the world’s most sublime wines – Meursault, Volnay, Pommard, Gevrey-Chambertin and many more. Returning to the ship for lunch. Your five-star floating hotel is moored in the picturesque historic center.